Upon arrival at Chennai International airport meet with our company representative followed by assistance transfer to the hotel. Overnight stay at hotel. 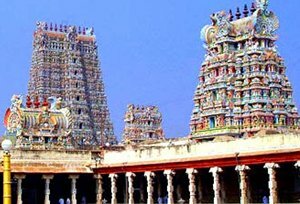 Today we will leave for Kanchipuram, situate 70 km from Chennai and west of Mahabalipuram which is a city of thousand temples. One of the seven sacred cities of Hindus, it was the capital of the early Cholas as far back as the 2nd century BC. Kanchi was a major seat of Tamil learning as well as an important place of pilgrimage for Buddhists, Jains and Hindus. Apart from temples, the city is also famous for its silk weavers, who settled here some 400 years ago and have given it an enviable reputation. Later in the afternoon we will leave for Mahabalipuram. Upon arrival check into the hotel. Evening free at leisure. overnight stay at hotel. After breakfast we will go on temple tour of Mahabalipuram. It is the ancient port of Pallavas. The pallavas have created many marvellous monuments with sculptural panels, caves, Monolithic Rathas and Temples. Krishna Mandapam has a big bas relief, notable for its realistic representation. The world's largest bas relief measuring 27m x 9m, whale back shaped rock contains figures of gods, demi-gods, men beasts, birds and representation of the entire creation. 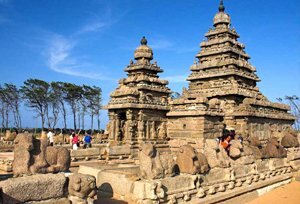 Shore Temple, one of the oldest in south dating back to 8th century AD is a good example of the first phase of structural temples constructed in Dravidian style. The Five Rathas are a group of five monolithic temples, each created in different style. Later we will return to Chennai. Upon arrival transfer to the railway station to board the train for Chennai. Upon reaching at Chennai railway station meet with our representative and then transfer to the hotel. Check into the hotel. Overnight stay at hotel. After breakfast we will go for temple tour of Trichy visiting the Srirangam, which is an island, 5 kms from Trichy. Surrounded by the Kaveri water is a 600 acres island town enclosed within the seven walls on the gigantic Sri Ranganathaswamy temple. There are no less than 22 gopurams, one of which is the tallest in India. The 72 m high 13 tiered gopuram dominates the landscape for miles around. The Rock Fort situated on the banks of the Kaveri River, Trichy's most famed land mark is an 84 m high rock, one of the oldest in the world approx. 3,800 million years. The attraction is not for fort itself but the temple at the summit. 344 steps hewn out of rock lead to the top where are the inscriptions dating back to the 3rd century B.C. Later in the afternoon drive to Madurai. Upon arrival transfer to the hotel. Overnight stay at hotel. Today we will awake a little early and proceed to witness the aarti darshan at Meenakshi temple. Later return to the hotel for breakfast. After breakfast we will explore the holy city Madurai visiting the King Thirumala's Palace, Great tank and Gandhi museum. Overnight stay in Madurai. Madurai, known as Athens of the East, is the second largest city on the banks of the River Vaigai. The city is believed to be more than 2500 years old. The city got its name from the drops of nectar (Mathuram) that fell from Shiva's lochs when he came to bless its people for constructing a temple for him. Madurai where the people wake up at the chant of hymns is proud of the magnificent Meenakshi-Sundareswara Temple. Of its 12 gopurams, four of the tallest stand at the outer walls of the temple. The 48.8 m high southern gopuram is the most spectacular and have over 1500 sculptures. In the Ashta Shakthi Mandapam inside the Meenakshi temple, the sculpted pillars tell the story of the beautiful princess of Madurai and her marriage to Lord Shiva. After breakfast we will leave for our wildlife destination of Periyar. Upon reaching Periyar check into the wildlife hotel / resort. After fresh-n-up we will go for the spice and tea plantation tour of Periyar. In Thekkady there are many spice gardens, during our visit we will get to know about the variety of spice like cardamom, pepper, vanilla, clove, cinnamon, nutmeg, ayurvedic herbs etc. We will also have a stop at the factory situated here. This morning we will go for a 1 ½ hrs motor boat cruise on Periyar lake, operated by KTDC. during our boat trip we will be able to see wildlife like Elephant, deer and a lot of birdlife. Later return to the resort for breakfast. After breakfast we will go for Jeep safari in Gavi National Park. The jeep safari to Gavi, picturesque land, is the major off-the-track destination ideal for a wilderness retreat replete with trekking, birding, canoeing and facilities for boarding. This biological garden, with hills and valleys, tropical forests, sprawling grasslands, shoals, cascading waterfalls and cardamom plantation, is home for many endangered species like lion tailed macaque; nilgiri Tahrs etc. and they can be sighted also. Later return to resort. If time permit we will visit a few tribal villages around Periyar and witness fascinating activities of tribals collecting honey from dangerous hill bees. Evening transfer to hotel. Overnight at hotel. After breakfast we will leave for Cochin, the capital city of state Kerala. Upon arrival check into the hotel. 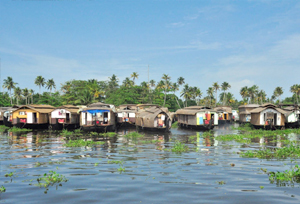 After fresh-n-up we will go on a guided tour of Cochin - the commercial capital and the most cosmopolitan city of Kerala. Visiting The Dutch Palace, Synagogue, the famous Chinese fishing nets. Today we will leave for Ooty the queen of hills enjoying the nature trail on the way. Upon reaching transfer to the hotel. Overnight stay at hotel. Morning free at leisure. 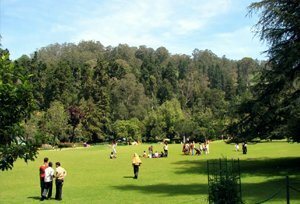 After lunch we will go for an excursion around Ooty visiting its botanical garden - The Government Botanical Garden, Udhagamandalam was established in 1848. The Gardens have around a thousand species, both exotic and indigenous, of plants, shrubs, ferns, trees, herbal and bonsai plants. In the centre of the Gardens lie a fossilized tree trunk estimated to be 20 million years old. Also visit Ooty Lake - it is an artificial lake constructed by John Sullivan, in 1824. The water flowing down mountain streams in the Ooty valley was dammed to form the lake. The lake is surrounded by groves of Eucalyptus trees with a railway line running along one shore. During the summer season in May, boat races and boat pageantry are organised for two days. Doddabetta peak - It is the second highest mountain in the Nilgiri Hills, at 2637 metres (8650 feet), after Anamudi. There is a reserved forest area around the peak. It is a popular tourist attraction with road access to the summit. After breakfast we will drive to Bandipur via Mudumalai. Upon reaching at Bandipur check into the wildlife resort. After lunch we will go for a guided walk to explore the forest of Bandipur. During our nature walk we will be able to sight a lots of wildlife in Bandipur. Later return to the resort. Overnight stay in Bandipur. Today we will wake a little early and get ready for our first Jungle experience to spot the wildlife. We will board the vehicle to explore the Bandipur National Park. Later return to the resort for fresh-n-up and breakfast. After breakfast it's time to enjoy the serenity around the resort or one can participate in the various house activities. After lunch we will again board the vehicle to enter the Bandipur forest. Evening return to resort for overnight stay. Today we will leave for Bangalore the capital city of state Karnataka. Upon arrival check in to the hotel. After fresh-n-up we will go for half day city sightseeing tour of Bangalore visiting the Lalbagh garden, the botanical gardens that is spread over 240 acres. Later you will be taken to Tipu Sultan's Palace, before proceeding on to the Bull Temple, believed to have been built in the 16th century. Morning after breakfast we will transfer to the airport to board the flight for Chennai. Upon arrival at Chennai airport meet with our representative and transfer to the hotel. Rest of the day free at leisure or you can opt for some shopping in Chennai. Overnight at hotel. Transfer to the Chennai international airport on time to board the flight for onward destination.